Some people learn from their mistakes almost immediately or even before they even make then. For others it takes more time to really understand the error and how to properly navigate it down the line. Both ways of learning have their own benefits which might surprise people, but ultimately we all learn at our own pace. 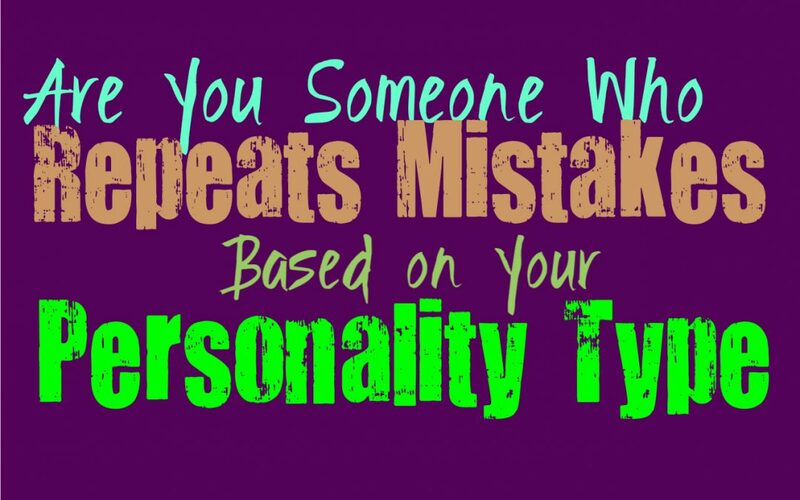 Here is how much each personality type tends to repeat their mistakes. INFJs do believe in learning from their mistakes, unless those mistakes happen to be within their comfort zone. They do sometimes struggle to really step out of the things they are comfortable with, since certain change can feel unnerving for them. This desire to stick with what they know, can sometimes cause the INFJ to repeat certain mistakes, since having to change or adjust would alter their lifestyle in ways they aren’t entirely comfortable with. INFJs are more than capable of learning from their mistakes, but sometimes their emotions can trip them up when it comes to the people they love. ENFJs don’t like repeating mistakes, since they don’t like making them in the first place. When it comes to mistakes which can affect their lives or their loved ones, the ENFJ absolutely does not want to repeat then. They prefer not to make any mistakes in the first place, since they can be perfectionists. For the ENFJ it feels like a major failure if they cannot find ways to overcome any mistakes and truly learn from them for the future. They do sometimes struggle with too much change, and in these situations they might repeat certain mistakes but only ones that aren’t obvious. INFPs do sometimes repeat their mistakes before actually adjusting their behavior, especially ones they don’t mind experiencing. For them it is more rewarding to experience life on their own terms, instead of striving to live up to the expectations of the world. While INFPs don’t always learn from their mistakes immediately, this doesn’t come from a lack of intelligence. For them it is more about really learning about the mistake on a more personal level and learning to accept when they want to make a change and more forward. ENFPs do have a tendency to repeat their mistakes before they move forward and decide to make a change. Sometimes for the ENFP it isn’t about an inability to learn from their mistakes, but from a desire to experience them once again. For them certain mistakes can be rewarding in some ways, especially since it can help them learn even more. ENFPs also have a tendency to dive into things without really thinking twice, since they can be somewhat impulsive and passionate people. INTJs definitely don’t repeat their mistakes, since they prefer to avoid making them in the first place. They work hard to prepare themselves for any potential situation, and so they want to avoid stepping into something without being ready for it. For the INTJ repeating mistakes comes from ignorance and that is something they simply won’t stand for. They believe in learning from their experiences and finding ways to fix any problems that might occur in their lives. Because of that the INTJ definitely strives to learn and grow so that they can avoid repeating mistakes. ENTJs don’t believe in repeating their mistakes, since this shows a lack of efficiency. ENTJs don’t believe in allowing their mistakes to take them over, instead they work hard to get things done. For them it is important to learn and grow from each experience, and even from their mistakes. While ENTJs prefer to learn from any errors they might make, they still prefer to avoid making them in the first place. To the ENTJ someone who cannot learn when they do something wrong, is someone who is completely ignorant and even a bit lazy. INTPs definitely believe in learning from their mistakes, and so they don’t like repeating them. For the INTP it is about learning from their experiences and understanding how to change if they need to. INTPs are very intuitive people who can often understand the best way to avoid mistakes before they even occur. In most situations they don’t like repeating any blunders they might make, but in some situations they might feel like they can learn better by diving in once again. The only times INTPs might have a tendency to repeat mistakes is when they are dealing with loved ones, since they do struggle to really understand emotions and how to navigate them. ENTPs prefer to experience life at their own pace, and so sometimes this means they chose to repeat certain mistakes. For the ENTP the best way to really learn is often by experiencing something, and so that sometimes means diving into something they have already messed up on before. ENTPs often believe that mistakes are meant to be ways to learn and really expand their minds in new ways. For the most part they know how to avoid making mistakes and how to learn from them right away, but that doesn’t mean they won’t repeat them from time to time. ISTJs are not often the type of people who repeat their mistakes, since they don’t really enjoy making them in the first place. ISTJs prefer to be prepared for anything and want to do whatever they can to avoid making mistakes. For them it is best to be efficient and focused, and so they are often perfectionists. For the ISTJ it is a bit stressful to make mistakes, and they can feel like failures in these instances. While they want to avoid making these blunders in the first place, ISTJs are certainly not likely to repeat them in the future. ESTJs aren’t the type of people who repeat their mistakes, since they are perfectionists who prefer not to make them in the first place. For the ESTJs it often feels like they have failed themselves and others if they cannot seem to learn from their mistakes. They want to avoid doing anything that might upset others or hold them back from accomplishing their important goals in life. ESTJs are not likely to repeat mistakes and can often deem this as laziness when others do it. ISFJs don’t often repeat mistakes, especially ones that affect their loved ones and themselves. They work hard to be efficient and accomplished people and don’t like feeling like they have failed. ISFJs are perfectionists and because of this they can be rather hard on themselves. When they make mistakes they often feel like they have failed those around them, and so they certainly don’t want to let this happen again. ISFJs do their best to avoid repeating mistakes, or even making them in the first place. ESFJs are perfectionists and because of this they can become deeply upset if they make too many mistakes. When they do something wrong which might affect those around them, the ESFJ wants to do their best to make amends for this. They certainly aren’t the type of people who will be fine with repeating their mistakes, and so they do their best to avoid this in the future. For ESFJs there are certain mistakes which they might repeat, but often these are ones which are self-sabotaging and not ones that harm their loved ones. ISTPs are analytical people but at the same time they enjoy experiencing life with a bit of thrill. Sometimes their desire to dive into something exciting and rewarding, can cause them to repeat certain past mistakes. They don’t do this because they are unaware, but simply because they don’t like feeling controlled or held back from really enjoying their lives. Sometimes ISTPs repeat certain mistakes simply because they want to, and not because they cannot see what is coming. ESTPs can sometimes repeat their mistakes, since they aren’t as focused on their past. They focus so much on the present and because of this they do have a tendency to walk back into things which have harmed them in the past. ESTPs are passionate and intense people who seek out excitement in their lives. They don’t like feeling like they need to constantly think about things before diving in, and sometimes when they become stagnant they will repeat past mistakes. ISFPs do have a tendency to repeat their mistakes, simply because they are not analytical people. ISFPs are much more heart than they are head, even though they can be truly intelligent. For them it is a choice, since they believe in following their morals above most other things in life. If something feels right for the ISFP they will lean towards this direction, even if it seemed to have fail them in the past. ESFPs do sometimes repeat their past mistakes, simply because they focus so much on the present. They are impulsive and passionate people, who want to experience the present with a sense of excitement. The ESFPs desire to really follow their hearts and go after what makes them happy, is the exact thing that causes them to repeat their mistakes. They don’t always analyze their actions enough to recognize when they should adjust their behavior, and so they fail to really recognize when they are repeating certain errors in judgment.